Bankruptcy Lawyers - Can Bankruptcy Stop Foreclosure? In many cases, the best solution for anyone facing foreclosure is filing bankruptcy. Bankruptcy restarts the process of making monthly mortgage payments and getting caught up to save the home. Those looking for a cheap bankruptcy lawyer in Los Angeles should call Consumer Action Law Group, their attorneys provide free bankruptcy advice and answer questions so it is possible to make informed decisions about saving the home. Bankruptcy may sound drastic, but it is one of the best solutions for those who have found themselves in a perilous financial situation. For anyone searching for a cheap bankruptcy lawyers in Los Angeles, Consumer Action Law Group attorneys are available to help you, and they will take the time to explain the pitfalls and the benefits of bankruptcy free of charge. Hiring a cheap bankruptcy lawyers in Los Angeles provides the opportunity to stop the foreclosure process from moving forward; the foreclosure will stops at the time of filing. This allows a borrower to deal with what matters most before having to deal with any kind of foreclosure threats. For anyone losing sleep over the financial threats on a home or assets, consider looking into bankruptcy as an option. It might seem extreme as a solution, but it is very effective. Call Consumer Action Law Group, the bankruptcy attorney here will evaluate the situation and provide free bankruptcy advice on the first call. First things first, filing bankruptcy will clear debts such as credit cards and medical bills that have accumulated. This can be the simplest solution for anyone struggling with unsecured debts. Filing bankruptcy can also wipe out old IRS debt, other personal loans, and sometimes home equity lines of credit. 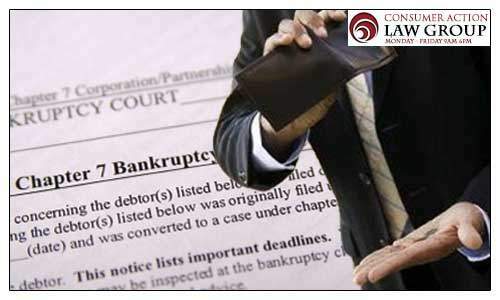 Most importantly, hiring a cheap bankruptcy attorney to file bankruptcy allows one to keep their assets and get rid of debt. This will free borrowers from the looming pressure of a foreclosure or repossession of their car or other belongings.